I have been using HFF progesterone cream for approximately 6 months. This cream has "saved my life". The results of using HFF have been dramatic for me. I had a partial hysterectomy last September 2004. Immediately following this surgery, I developed terrible ocular migraine headaches. My doctors could do nothing to help me – and progesterone supplementation was never mentioned to me. Through research of my own, and internet websites, I found your company and began using HHF. The headaches ceased almost immediately. I has also suffered from "tingling and numbness" of scalp and side of face. This was extremely annoying and would sometimes accompany the headaches. Since using HHF that problem is also a thing of the past – thank goodness. I felt so tired, sick, old; just plain worn out, and had no sexual desires whatsoever. 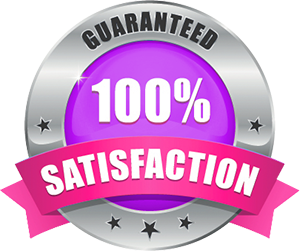 After using HHF for a few months, my sexual desires as well as natural body functions have not only returned, but also are far greater that ever before. It is amazing what this cream has done for me. I call it my "miracle cure" and could never be without it. I am so thankful to your company for making such wonderful products available to women such as myself. It is comforting to know that there are knowledgeable people there who can answer my questions and provide helpful, reliable information. I just wanted to write to tell you how lucky and grateful I am to have found your company. I have always been someone that has seemed to have menstrual difficulties and hormone imbalances, especially from stress. I always just thought it was normal to feel this way and didn’t know how important it was to balance my hormone levels or that one could even do that. Finding your company has been a godsend and absolutely has changed my life. I will forever use your cream, and I’m even getting my mom to use your products. I wish your company all the success in the world and would recommend it to anyone who thinks they have to suffer month to month. I wanted to take a moment to thank you for all the help your products have given me. I couldn’t have done it without. The contribution your company is making in this world is awesome. I had been suffering from severe Hot Flashes for over 3 years, and nothing my doctors were doing was helping. After finally doing some research of my own I realized that stress was probably contributing to my hot flashes. I found your product and started using it twice a day. After about 2 weeks I began to notice the severity as well as the number of hot flashes per day had decreased dramatically. I have now been using HHF for about a year, and while I still have an occasional hot flash this is nothing compared to what I was dealing with before. This product works, and has made a huge difference in my life. A naturopathic practitioner that I had been working with for a few months recommended this product to me. We had tried what seemed like dozens of herbal and homeopathic remedies for my hot flashes, and nothing was working. I started using HFF in the morning and again before bed, and after only a week my hot flashes had really decreased. I had been getting them throughout the day and night, and now I may get 1 or 2 a day! I can’t believe I had been suffering for so long with your product available. I’m now only using it in the morning and my hot flashes are still under control. I am a postmenopausel gal of 62 who has night sweats that could keep a watermelon patch happy! While visiting family in Kentucky recently, I was given a jar of Hot Flash Freedom to try. And I gotta tell you . . . I was very skeptical! Ten days later I realized that I was actually sleeping all night long without wakeing up 3 to 4 times with night sweats. And all it took was twice daily applying a small amount of Hot Flash Freedon cream to a soft part of my body (inner arms, sides, etc.) Now my jar sits right beside my toothbrush . . . but I’m so pleased with the results that I don’t need to be reminded. Thank you for giving me back a good nights sleep! 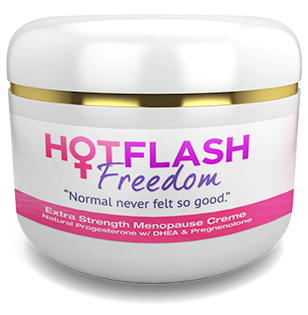 I started using Hot Flash Freedom the end of April 2007, as I was the "Queen of Hot Flashes". I am 51 yrs. old and have had hot flashes and night sweats for several years now. After getting off of my hormone medication decribed by my doctor (I was afraid to keep using it with all the talk about cancer) my entire life changed. I tried just about every cream and pill on the market, and there was not one thing that seemed to help me at all. Finally through the internet search I found "Hot Flash Freedom". After using it since the end of April I have finally started to be myself again. I still have a few hot flashes during the day, but they do not last but a very little while. The night sweats are 90% better, I can sleep most nights all night long now. My life before this cream was going down hill very, very fast.I had gotten to the point that very morning right after I had taken my shower, in no time at all I was soaking wet. I couldn’t believe that I had just showered and in a few minutes my entire body was so sweaty and I couldn’t even sleep at night for waking up soaking wet.I didn’t really care too much about anything, but now I am becoming myself again. I am happier, I feel so much better, and I will never be without this cream for one day. Thanks for giving me my life back, I have even lost a few pounds because I am able to walk and excerise a little(not that much exercising), and I care about myself again, my looks, my life. I almost gave up a few times because I didn’t seem to be feeling any better, but thanks to Scott, he told me to hang in there and it would be better, so I did. I can’t tell you how much better I feel now, because of this cream. If you are feeling like I was, give this cream a try, it may take several months, but don’t give up. If it works for me ,(Queen of Hot Flashes, and Night Sweats, I hope it will work for you. Good luck, and remember we deserve to be happy and to be good to ourselves.